The GROHE Eurosmart single-lever bath mixer – modern design and performance at a very affordable price! With a solid metal handle and dynamic forward-leaning lines, the GROHE Eurosmart single-lever bath mixer perfectly complements all modern bathroom styles. Deck-mounted and packed with GROHE’s innovative technology, it is a pleasure to use. The GROHE SilkMove ceramic cartridge guarantees the precise and effortless control of water volume and temperature. Finished in sparkling but hardwearing GROHE StarLight chrome, the bath mixer is easy to clean will stay looking pristine for years to come. And our hassle-free GROHE QuickFix system cuts the one-hole installation time by up to 40%. The handy diverter makes it super easy to switch between bath and shower outlet. Simple luxury! 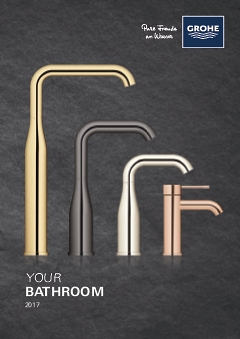 GROHE Eurosmart – where bathroom style meets functional perfection.